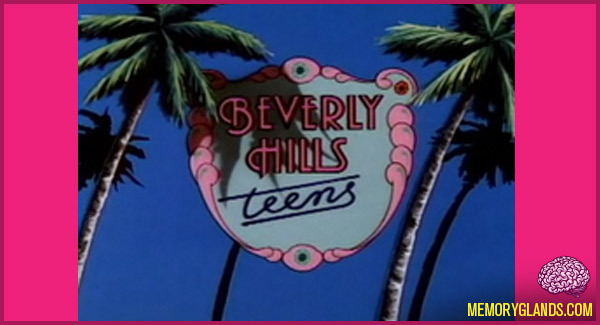 Beverly Hills Teens (later known as Beverly Hills Teen Club) is an animated children’s television program which debuted in 1987, animated by DiC Entertainment. The namesake teenagers have exaggerated wealth, and face stereotypical teenage concerns. They represent a variety of European backgrounds. There are sixty-five episodes all in one season, each thirty minutes long. The original title song was performed in both the English and French versions by Valérie Barouille. The show originally aired in first-run syndication in the United States. In 1989, Beverly Hills Teens was nominated for the Young Artist award for Best Animated Series. In the same year, the show was syndicated by Claster Television as part of a package featuring Maxie’s World (the “lead” program) and the non-DIC series It’s Punky Brewster.